He speaks German (and understands it): Its true, Dylan also speaks English, but more and more a lot of the words he knows are the German versions. Here's just a short list of words that he says in German: bitte (please), danke (thank you), Puppe (doll), Auto (car), Oma/Opa (grandma/grandpa), der Ball (ball, but he always says it with the proper German article "der"), brot (bread), Schlange (snake), Pferd (horse), Papagei (parrot), lecker (yummy). In addition to that, our German friends speak to him in German and he seems to understand it pretty well - better than I do, actually. His Diet - Dylan has a diet like a lot of Germans - heavy in bread and yogurt. It seems like every meal involves a lot of bread and is capped off by some kind of yogurt. He also is completely obsessed with mineral/fizzy water, which he calls "bubbles." Nothing is more German than preferring fizzy, carbonated water to regular drinking water. German Television - He loves watching German kids programs on KiKa (German PBS) including SesamStrasse (German Sesame Street) and has learned some songs, mainly from TanzAlarm ("dance alarm"). One song teaches kids the vowels but in German they are pronounced "ah, eh, eee, oh, uuuuuu", so he might be confused when we also try to teach him the English version and pronunciations of "a, e, i, o, u". Bryan and Dylan watch the TanzAlarm song over and over again and it's not uncommon to walk in on them singing and dancing together. He Sleeps on the Floor - Well, technically he is on a mattress on the floor, but it's at least been our experience that a mattress on the floor isn't all that unusual here. The first time we lived in Germany (8 years ago) we only had mattresses and no bed frames, as did our friends and their kids. Maybe we were all just too poor to realize that's not normal, but from then on we always associate a mattress on the floor to living in Germany. In addition to bread and yogurt, Dylan loves peas. It's one of the few vegetables that he'll eat, so he gets them a lot. Going to the fire station nearby and checking out all the trucks is one of his favorite things to do. He tries to compete with the sounds of the sirens and screams "weeeee-ooooooo weeeeeee-oooooo!" He appears to be a right-handed shooter. One of the biggest differences that we've noticed in living in Germany this time is that we're not so strapped for food options as we were 8 years ago. Maybe it's because we were living in such a small village the last time that they grocery stores just had fewer options, or maybe Germany is catching up to having more American-style food available in stores. Either way, we've been pleased with what's available; however, there are still several items we find ourselves craving. 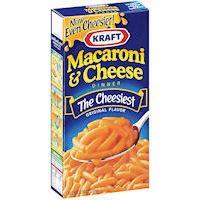 Kraft Mac n Cheese - This is always at the top of the list of things we ask people to bring when the come to visit. If you are coming to visit us, it's very likely that you will get an email beforehand saying something like, "We can't wait to see you in a couple of weeks, but you are only welcome here if you bring us 5 boxes of mac of cheese. Seriously. Love, Dana"
It appears that we are ready for some more visitors as we just ate our last box yesterday. 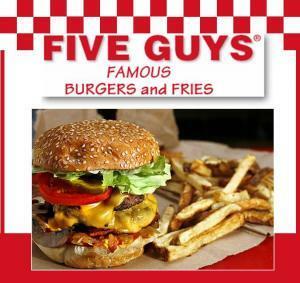 Wendy's / Five Guys (aka: hamburgers) - Germany hasn't really figured out how to make a good hamburger yet. Yes, our town has a McDonald's, which tastes the same everywhere in the world, but regular restaurants really don't make the grade. Bryan is really hankering for a Wendy's Junior Bacon Cheeseburger and I am dying for a Five Guys Burgers and Fries cheeseburger. Ever wonder why Americans are overweight? Cheddar cheese - The best of all the cheeses is nowhere to be found (for a reasonable price) here in Deutschland. I have no idea why this cheese has not gained popularity here in the land of Munster and Gouda, but these Germans missing out! The only cheddar cheese I can find in the stores is Irish Cheddar Slices - so for 1.99 Euros, I can get 5 measly slices of cheddar cheese, barely enough to sate my craving. Chips + cheese - One of our favorite snacks to make in America was tortilla chips smothered in shredded cheddar cheese and microwaved to melted perfection. But, natural flavored tortilla chips are hard to come by and cheddar cheese (nonetheless, shredded cheddar cheese) is impossible. Papa John's Pizza - The Germans have not figured out how to properly do delivery pizza. 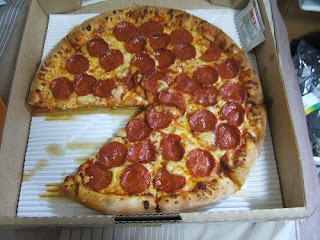 The crust is not doughy, the sauce isn't very flavorful and the cheese isn't very cheesy. If you're looking for a peperoni pizza and order it with "peperoni," your pizza will come with green and red peppers. The correct toppings to order here is "salami" if you want an American-style peperoni pizza. If you're not careful and don't know your food vocabulary, you can also get some crazy toppings that don't really work on pizza - like tuna-fish, canned peas and carrots, and shrimp. We've learned the hard way. This is how a pizza is supposed to look. 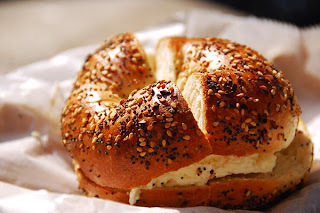 Bagels - Oh, how I miss "Everything Bagels" loaded with plain cream cheese. The cream cheese I can get here, but the bagels are just plain gross. Only 1 grocery store in town has bagels and they usually taste stale and flavorless. Can we please get a Bagel Shop here? 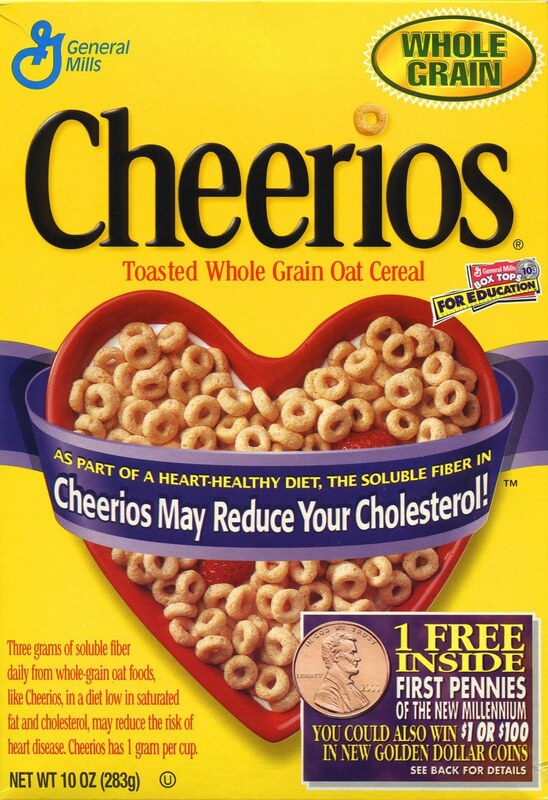 Cheerios - Germans are not into cereal. A typical German breakfast is a crusty bread roll with cold cuts and cheese and a hard boiled egg, so it's no surprise that they cereal selection here is really lacking. I find it surprising that in our little town I can find Cinnamon Toast Crunch but no Cheerios. Our store carries about 6-8 different kinds of cereal total. I told one of my friends here that the cereal selection at an American grocery store fills both sides of a store-length isle and she couldn't even wrap her head around how there could possibly be that many types to choose from. Anything Mexican - No surprise that good Mexican food is hard to come by in Germany. There is an over-priced Mexican Restaurant in town, but it really doesn't compare to the authentic Mexican food we could get at La Nopalera or Los Toros in Jacksonville. Even a Moe's or Sierra Grill would be a huge improvement from what's available. Honorable Mention: Buffalo Chicken Wings and Ben + Jerry's Ice Cream - This is honorable mention because ironically about a 25 minute bike ride from our house is a restaurant called The Daytona Roadhouse Bar and Grill, which is actually modeled after roadhouse-style restaurants in Daytona Beach, Florida and they serve plenty of chicken wings. Their buffalo sauce doesn't have a lot of "kick" to it, but since we can actually get this nearby, it only received honorable mention. This same restaurant has a mini-fridge stocked with Ben + Jerry's single-serve ice cream cups. Doner's. We still don't know why these haven't caught on yet in America. Bryan's not promoting world peace in this photo - he's actually eating his second doner in a row. Bratwursts. Currywurst's bald brother. 1/2 meter (19 inches) of heaven. Daytona Roadhouse. Satisfying at least two of our cravings. As you can clearly see from this picture, ice cream is really good here, but it's no Ben and Jerry's. Did you miss Part 1? Click here to get caught up. 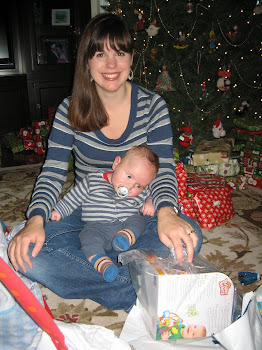 Monday morning, I was up and at the nearby Aldi Grocery store buying food for the next three days while Dana was getting Dylan up and ready to go. We made it out the door together around 9:45 am and made it to the Brandenburg Gate just in time for our Guided Walking Tour. We were in a group of around 40 people, and were around other Americans for the first time in 7 months. The Brandenburg Gate. We saw this the day before and had no idea what it was for. This gate was part of the Berlin Wall and was one of the few points of entry between East and West Berlin. Right by the Brandenburg Gate is the Hotel Adlon - famous for Michael Jackson's "Baby Dangling" incident. Here is Bryan at the Memorial for the Murdered Jews of Europe. This is a series of coffin shaped rectangles that start at ground level, get really tall, then end at ground level. The meaning is up to your own interpretation. The parking lot is approximately above Hitler's Bunker - where he spent his final days and killed himself. Not much of a memorial here. This building is what our tour guide called "a good example of Nazi architecture" - meaning, it is meant to make you feel very small. You can see the group of people at the other end of the corridor and how small they are compared to the ceiling. Even the door handle is at eye-level. 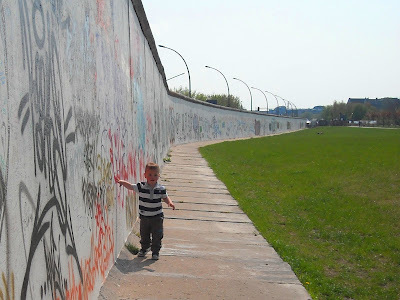 One of the few places in the city where the wall is still standing. Where the wall used to be is this double cobbled-stoned strip all throughout the city so you always know where the wall once stood. During our break, Bryan got to chase Dylan around. After the walking tour, we ate lunch and ate the best Doner’s ever (or we may have been really hungry from the walking tour). I actually polished off 2 Doner’s in one sitting. Usually one is more than good enough. Two was a little too much. We went home after that and put Dylan to bed for his nap. After that lunch, I napped just as long as Dylan. Bryan enjoying his second doner in a row. Tuesday was our (sort of) map/agenda free day. Although the walking tour/tourist destinations are a necessary part of exploring a new city, learning about the city ‘off the beaten path’ is a better way to really learn about a city. Dana was ok with the agenda free day (as long as we made it to the East Side Gallery), but was not keen on a map free day. Once we made it off East train station (Ostbahnhof), we wandered across the river to a really shady part of town (and I am not talking about tree shade.) We had unknowingly walked into a squatter/gypsy community. It was the first time ever in Europe where we felt a sense of danger, but concluded that it still wasn’t as dangerous as our neighborhood in St. Augustine on a Friday night. We continued to take the next possible right hand turn to get out of the gypsy area. I kept thinking that the people that live here don’t believe in money, but would only be interested in taking my money if I asked for directions. Is that irony or ignorance? We made it out of the gypsy village and found our way to the East Side Gallery. We were able to get some good pictures there. That was really the last time we saw other English speaking tourists. That’s because we walked over the Oberbaum Bridge and wandered the artsy district of Kreuzberg. I use the word ‘artsy’ because it’s the best word to describe it. It was a fascinating area where everyone seemed to be either a hippy or an artist or both. We felt so out of place, that even using a baby stroller seemed too mainstream for this area. Family photo at East Side Gallery. We're actually on the "graffiti" side of the wall. The "gallery" is on the other side, but it also looks like graffiti. Bryan and Dylan on the gallery side of the East Side Gallery. This is a very good representative photo of the squatter/gypsy camp that we wandered into. So, not quite as unsafe as our neighborhood in St. Augustine, but close. After eating a great falafel for lunch, we continued to wander through the streets of Kreuzberg. At one point, we arrived at more burned out buildings/warehouses. Instead of looking like a gypsy camp, there were other German tourists walking in and out of the district. Having not learned from our previous mis-directions from the previous two hours, we walked in and found some really cool sites. The deeper we walked through these old buildings, the more we saw. Our tour concluded on the other side of these buildings, where auditions were being held for the X-Factor Berlin. I couldn’t get Dana to try out for the show (you should hear her belt out “The Itsy Bitsy Spider,” it will bring tears to your eyes) but it’s just a matter of time before the world will behold her brilliant voice. 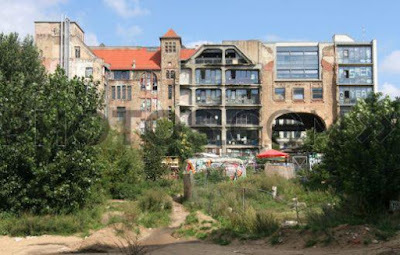 Kreuzberg district in Berlin. Very artsy / bohemian. Any old street corner will do for a diaper change. Dylan is getting used to it. Famous Berlin graffiti - across the street from where Bryan was changing Dylan's diaper. An old hollowed out bus - Dylan could have stayed here all day. Maybe he will grow up to be a bus driver. Dana and Dylan on the bus. We ended up walking the streets in this beautiful district and enjoyed a snack at the street *kiosk. *Tourist Budget Tip; A great money saving tip is to skip an overpriced restaurant and enjoy your snack/appetizer at a kiosk, where you can sit outside at a table. We were able to people watch and enjoy an appetizer at a fraction of the price of the next door restaurant. 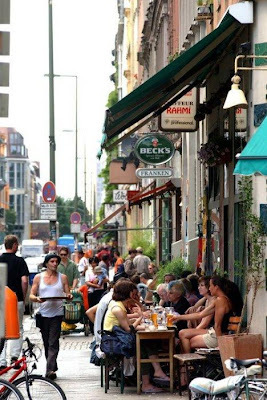 We continued to wander the streets, and settled on a nice outdoor café called Goldberg’s to eat dinner. We didn’t know where we were on the map because the streets were not on our map, but quickly found our location on the map by matching the restaurant name “Goldbergs” to the general “Jewish” district on our map. This dinner was our nice dinner (if you can a couple of sandwiches that) of our trip, and we stayed out until nearly 10 pm with Dylan, which was unheard of. We pushed him to his limit, but he was pretty good. The next morning, we were on our way out of Berlin, taking the same 6-7 trains back and arriving in Borken early in the evening on Wednesday. Although I wish we could have stayed a few days longer, we learned that it is possible to travel with a crazy and energetic 22 month old without losing our minds. We are planning on a more extensive trip this summer and feel that we can proceed with our plans to book it. Me whistling the Scorpions “Winds of Change” most of the trip. Found out today that the song was about Moscow. Maybe David Hasselhoff brought the Berlin wall down after all. Hmmm. Dylan pulling his shoes and socks off and smelling his feet in the middle of a full train. His “Ew!” could be heard a couple of train cards away. Starting to grow the Hockey Playoff Beard while on the trip. It’s working. They won the first round 4 games to 0. We taught Dylan how to ‘bump it’ on one of our many train rides. Now, he will say, “bump it” and give us his fist. We just hope he is not becoming a McPoyle from It's Always Sunny in Philadelphia. We are home from 4 amazing days in Berlin. It was our first time traveling to the eastern part of Germany as well as our first time traveling, at length, with Dylan. This was our test to see how far we can push Dylan with our travel schedule. Saturday, we said goodbye to Oscar and sent him off to a friend's house. Dylan was despondent after seeing Oscar leave and sobbed for a long time crying "Ohhhh, Oscar!" until we distracted him with basketball. We left for the train station at 2pm and made our long journey to Berlin via the German train system. Because it was a heavy travel day (no school for the week before and after Easter Sunday) we opted out of the really expensive direct train ticket and decided to save money by going with the more creative route. The ‘more creative’ route included two more trains (4 in all) in order to get to Berlin. We weren’t sure how Dylan would act on the train, let alone 4 trains, and it was a cause for some anxiety. On the train traveling somewhere in Germany. Dana and Dylan waiting for one of our trains. Dylan is eating his first Chicken McNuggets from McDonalds. Yumm. The yellow square indicated the "smoking section" on the train platform. Very effective. Luckily, the trip was largely uneventful. I had adequately prepared for the changeovers and succeeded by getting us to our destination without any hiccups. Dylan did his job and was really good in the trains and stayed up way past his bedtime like a champion. Finally arrived at the Berlin Haupbanhof. Still a few more trains to go. We arrived in the main Berlin Haupbahnhof (train station) around 10:30 pm on Saturday night. The main train station was electric and full of people. The atmosphere gave us all a second wind, especially this performance by a street performer (loose definition: she's probably just tripping out on drugs). Sorry for the sideways camera - we were trying to be discrete. Our apartment was about 30-40 minutes outside of town and I felt confident that we could navigate our way there by the subway system (and save us a 30 euro taxi ride). Seeing Dylan sitting in his stroller hugging his blanky and sucking his thumb through a web of armpits. I could hear him saying, “Daddy, Daddy”, from about 5 armpits away in his stroller. Wondering how we were going to get off the train at the next stop. It was going to be impossible. Asking how it was possible that all of the people (of all ages) were all out at 11:00pm. Accepting that we were at the mercy of the crowd and going to my happy place, convincing myself that everything was going to be ok.
Fortunately, the mass of people were also exiting at Alexanderplatz, so we were able to get off and resume our journey. We then made it to our next two subway rides without a hitch, though each train was really full of people. I couldn’t get over that it was almost midnight and all of these people were out on the town. Dana reminded me that ‘we are not in Borken anymore’ where nothing is open past 10pm. 9 hours and 7 trains later, we made it our apartment around 11:30pm Saturday night. Dylan stayed awake the entire time. We received the tour of our place from our gracious host, Iris, and went straight to bed. We booked our apartment from a website called www.holiday-rentals.co.uk for a really good price. Though it was a little outside of town, it was well worth being able to sleep in separate rooms from Dylan and have our own kitchen. Sunday morning, Dylan slept in until about 10:30 am. After the previous day of travel, we weren’t going to have a difficult schedule today. We took our time getting out the door and made our way, via the subway system, back to Alexanderplatz for the afternoon. Thank goodness there weren’t as many people on the trains this day. We spent Sunday afternoon walking around the historic museum island, which amazingly, is actually an island in the Spree River that consists of museums. We were able to get our bearings around the city and see the sights of the town. We realized this afternoon that we really needed to get a guided tour of the city because we didn’t have any background knowledge on any of these historic buildings. On Museum Island. If you look closely you can see Bryan and Dylan (in the stroller) standing on the bridge. Along the Spree River, Museum Island behind us. Tired boy up way past his bedtime. We headed back to our apartment late Sunday afternoon. Unfortunately, because no grocery stores are open on Sunday, I walked the entire suburb of Rudow (the area where we stayed) to try to find a place to buy some snacks for the evening. After an hour of walking, all I could find was a gas station that sold really overpriced snacks. I never realized how convenient it is to have shopping 7 days a week in America. After Dylan’s nap, we stayed in Rudow and went out to eat. Dylan cut our night a little short at dinner and we were back in our apartment by 8 pm. He needed a good night’s sleep. We had another big day coming up. One of my favorite things about living in this part of the world is that the seasons change when they are supposed to. It seemed like exactly on March 21, spring was ushered in and the temperature started to rise and now that it is April the weather is perfect - sunny, mid-high 60s - and everything is green and in bloom. It's a far cry from spring in Michigan which probably won't come for another 2 months, or spring in Florida which already happened back in January. This past weekend was Borken's Easter Market. It was a perfect warm, spring day and the whole town came to the town square for good food, craft vendors and fun. Below is a video from the Easter Market of some nice older ladies dressed up and singing an old German song. I have no idea what organization they're with, but they really added to the festive German-village atmosphere of the market. If we within 100 yards of this auto in the market place, we have to stop so Dylan can play on it. Dylan had to stop and play inside every single playhouse or on every toy that was set up in the town center. There were probably about 2 dozen total. Ok, all done with this one. On to the next. He spent some extra time on the pirate ship, which was his favorite. Playing on the little plastic rocking horse. Notice his tractor on the table and the basketball in his lap - can't leave home without them.